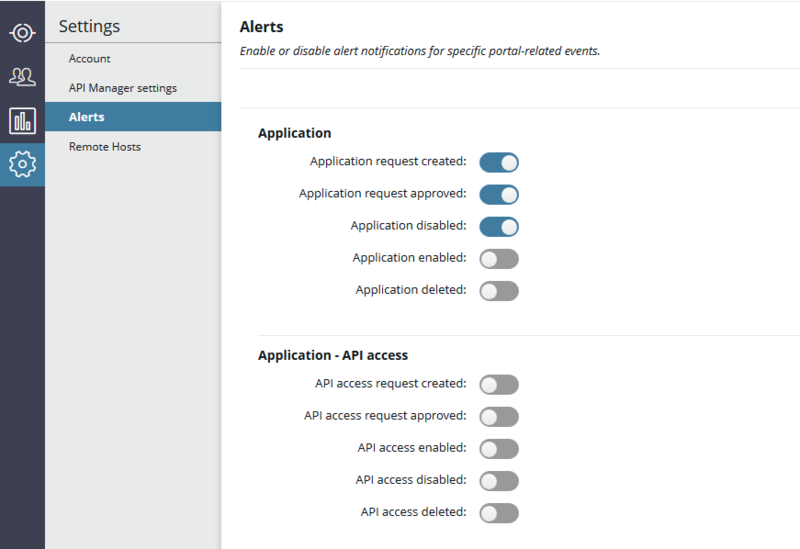 API Manager can generate alerts when specific events occur. For example, it can generate an alert when an organization is created or deleted, or when access is granted to an API. Policy developers can write policies that will be invoked when application credentials are created, updated, deleted, enabled, or disabled. For more information, see Change the alert policy to execute. For more information on the message attributes available to application credential alert policies, see Alert message attributes. API administrators can enable or disable alerts for application credentials so that the configured policies get executed when the specified events are triggered. For more information, see Enable or disable alerts. API Manager generates application credential alerts for events relating to application credentials. Create Application Credential Governance When an application credential is created. Delete Application Credential Governance When an application credential is deleted. Enable Application Credential Governance When an application credential is enabled. Disable Application Credential Governance When an application credential is disabled. Update Application Credential Governance When an application credential is updated. The application developer that created the application associated with the credential being created, modified, or deleted. Any application developer that has manage permissions for the application associated with the credential being created, modified, or deleted. API Manager generates application developer alerts for events relating to managing application developers. Approve Application Developer Registration Governance When a new application developer user is registered but approval is needed (auto-approve disabled). Application Developer Approved Governance When a new application developer user registration is approved (including auto-approve). Delete Application Developer Governance When an application developer user is deleted. Enable Application Developer Governance When an application developer is enabled. Disable Application Developer Governance When an application developer is disabled. Reset Application Developer Password Governance When an application developer password is reset (not changed). You can change the policy that is executed when an alert is generated in Policy Studio. 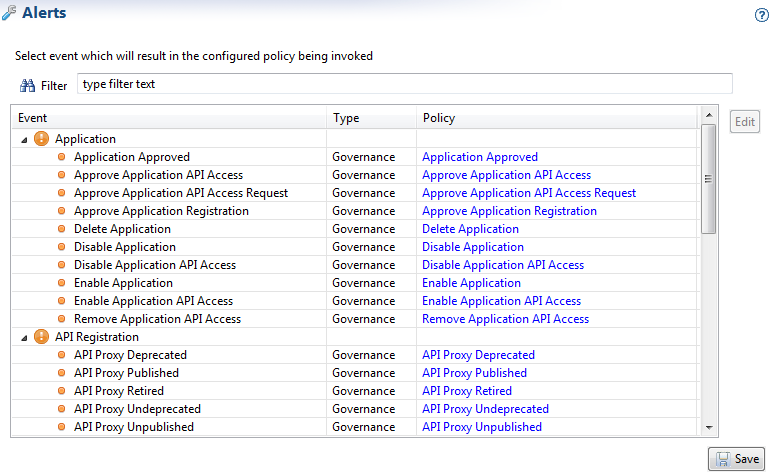 To view the API management alerts and the associated policies, click the Server Settings node in the Policy Studio tree view. On the Server Settings tab, expand the API Manager tree node and click Alerts.